'U2-3' was the first single released by U2, originally appearing in both the 7" and 12" formats - the latter highly sought after by collectors. Only 1,000 copies were pressed and were individually hand-numbered by Jackie Hayden, formerly Marketing Manager at CBS Records in Ireland and later General Manager at Hot Press magazine. This collectible had all four band members' names scratched into both sides of the vinyl and the word 'Ireland' appeared on the label. The original 7" version had UKTM No.B81 8091 written on the label after the copyright. Three songs were in contention to be the a-side for the single so DJ Dave Fanning was asked to poll listeners on his radio show to vote which song should be the a-side. The three songs were Out of Control, Boy/Girl and Stories For Boys. Fanning's listeners chose Out Of Control, a song that Bono wrote on his 18th birthday. 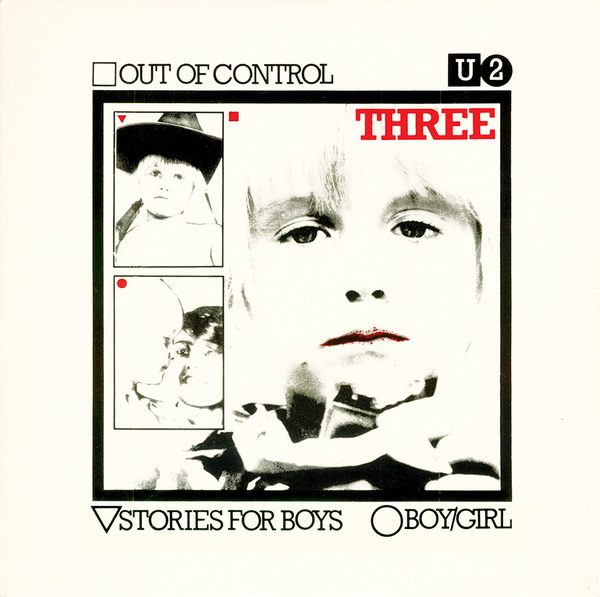 Both Out Of Control and Stories For Boys appeared on the Boy album. Boy/Girl was only released as a single. On January 15, 1980, U2 performed Stories For Boys on the Late Late Show. Out Of Control can be found on the Irish A-Z Of Rock compilation. Stories For Boys can be found on the Just For Kicks compilation of Dublin bands, with sleeve notes by Dave Fanning. A live version of Stories For Boys was released as a b-side on the Sweetest Thing single. This version was a different mix than the one on Just For Kicks and a slightly longer version than the one on Boy. A live version of Boy/Girl was also released as a b-side on the 7" I Will Follow single. In September 2015 I traveled home to Ireland from Australia. I stayed at my parents house in Ballincollig. One day my sister Maire told me that there was a box of my old vinyl upstairs. We went upstairs to see. The first record that I pulled out of the box was U2's first commercial recording it was an EP called U2 Three! The record has sat quietly and undisturbed in that box for 36 years... A lifetime.